A medley of pea-sized homemade treats (photo below) comes in very handy for distracting your dogs through necessary but unpleasant situations, ie. 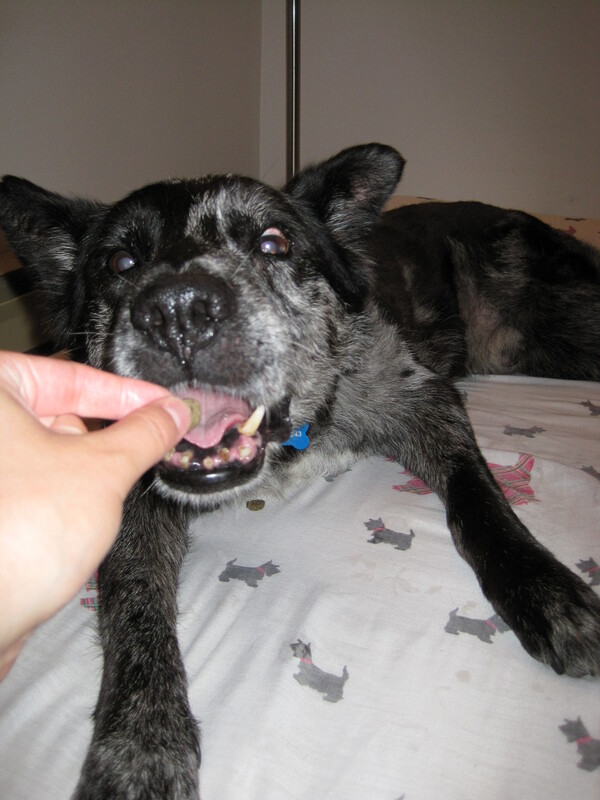 vet visits, nail grooming, osteopath and acupuncture treatments, etc. (A friend of mine calls these party mixes. I don’t know what I would have done if she hadn’t shared this technique with me. Thank you Marie-Emmanuelle!) Recipes are posted below. Also, my dog will gladly take medication when it’s hidden in cheese. I’ve found that cream cheese is the easiest to work with. Preheat the oven to 350 F. In a large bowl, combine all of the ingredients with just enough water (up to 1/2 cup) for the dough to come together nicely. Mix well with a wooden spoon. Then between a silpat (silicone) mat and a piece of parchment paper, roll the dough out to between 1/4 inch and 1/2 inch thickness. Cut the dough with cookie cutters (I used a small dog bone shape). The dough won’t spread when baked so you can cut the shapes close together. 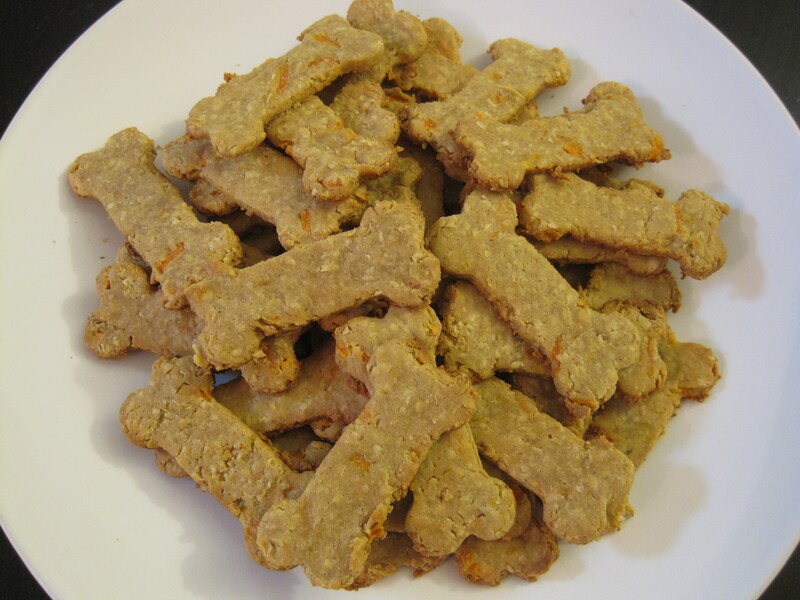 Remove the excess dough between and around your shapes and reuse it for another batch of dog biscuits. Slide the silpat mat and cut out cookies onto a baking sheet and bake until golden brown, between 15 and 25 minutes depending on the size and thickness of your cookies. Allow them to cool completely on the baking sheet. 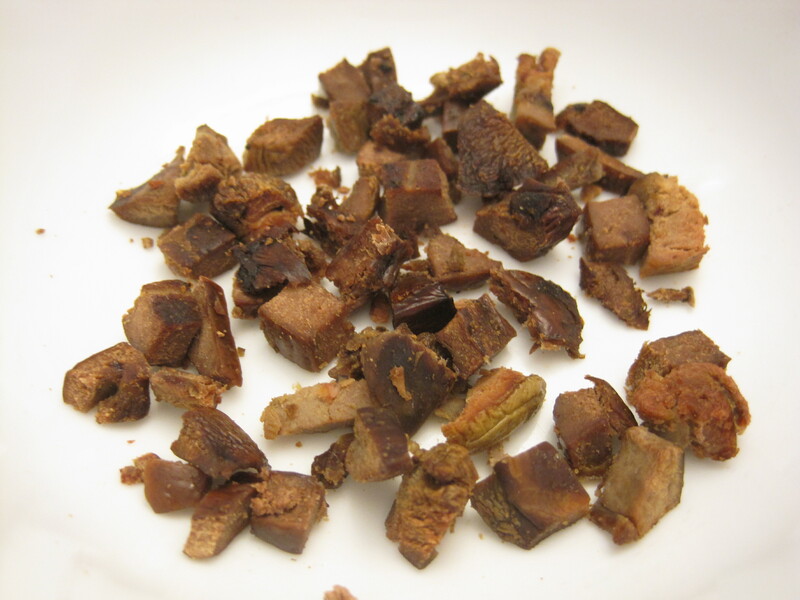 These can be stored in an airtight container at room temperature for about one week or stored in the freezer. The main ingredient of this recipe is ground meat. It also contains a sweet potato and an egg. I haven’t tried it yet, but it sounds excellent so I thought I’d share the link. If the mixture feels too wet, I’d recommend adding a bit of brown rice flour. If you try it, let me know how it works for you. Homemade Kongs. I give my dog frozen raw beef marrow bones to chew on. When he’s done with them, I keep the short and wide ones, remove all remaining tissue and marrow, and clean them with soap and water. Be sure to rinse them thoroughly under cool running water and do not boil the bones. Then I fill them with plain, Balkan style yogurt. (A friend of mine makes a mixture of yogurt, bananas and peanut butter for her dog.) Freeze the yogurt filled bones overnight (in a ziploc freezer bag) and give them to your dog straight from the freezer. Keep the bones in the freezer when not in use. Replace the bones with new ones after a few uses. I buy dehydrated chicken fillets or breasts. They only contain one ingredient: chicken. You could easily make them yourself. Simply pound the fresh, chicken fillets or breasts thin and dry them out completely using a food dehydrator. 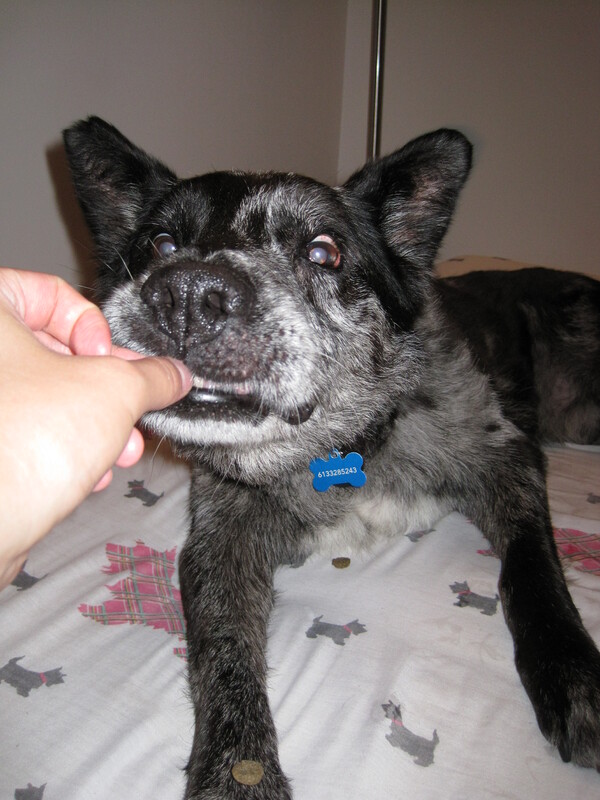 If your dog likes to eat ice cubes, try giving him frozen cubes of fruits and vegetables. Use a food processor to grind a small amount of assorted fruits and vegetables. Spoon this into an ice cube tray, add water, and freeze over night. If your dog will eat them, it’s a great way to get them to eat their veggies. 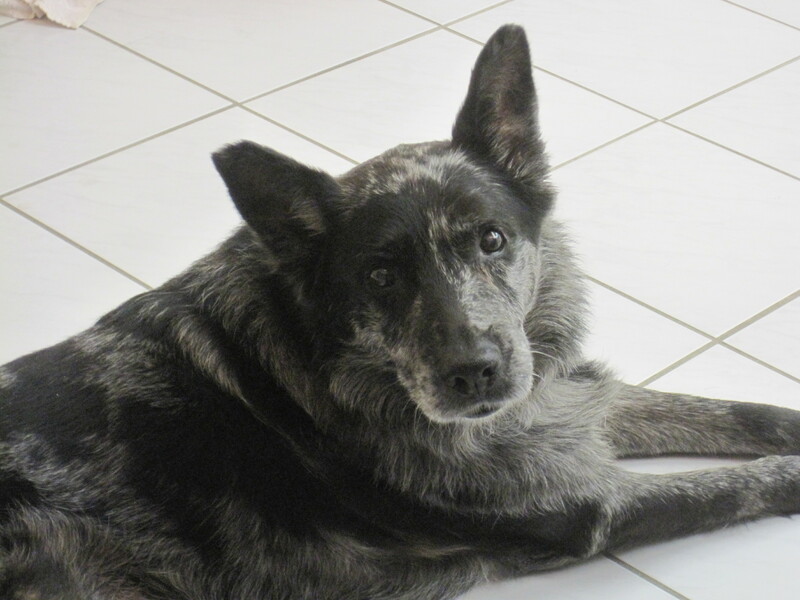 Be sure to read up on food intolerance and allergies in dogs before doing this. For example, the list of foods to avoid includes, but is not limited to, onion, corn, grapes, avocados, etc. Unseasoned, boiled or roasted chicken breast (fat removed) cut into pea-sized pieces. I store these in the freezer until they’re needed. They can be given to your dogs frozen. Cook unseasoned fresh calf liver and chicken gizzards (hearts, kidneys, and liver) in the oven at 375 F until cooked through. Depending on the type and size of gizzard, this could take up to 1 hour and 15 minutes. Allow to cool completely and then cut into pea-sized pieces. Store in the freezer. These can be given to your dogs frozen. 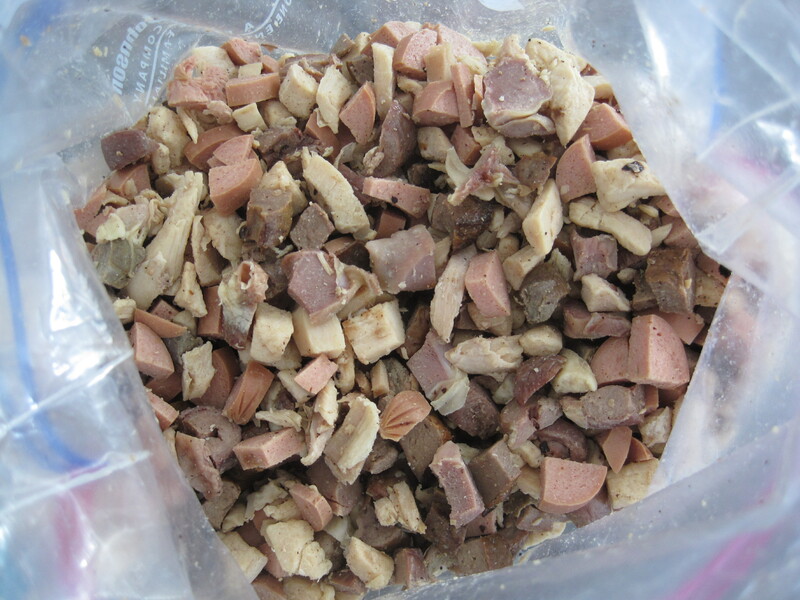 Photos below of chicken gizzard treats (left) and calf liver treats (right). Could you bake me a batch as a wedding gift ? Congrats on the 300th post! I’m loving your recipe and I’m adding it to my facebook right now. Woof! Thanks for your comment! I’m so happy for you!!! I LOVE my food processor 🙂 Happy holidays!